Almost 12 hours of poker was played, but the final hour belonged to 2016 @HPTpoker Player of the Year @RyanGregorKC, who bagged the top Day 1A Main Event stack at @StLouisPokerHC. Other Day 1A big stacks in the $1,650 buy-in with a $300,000 Guarantee include Joe Landazzi (322,000) and William Montague (303,000). 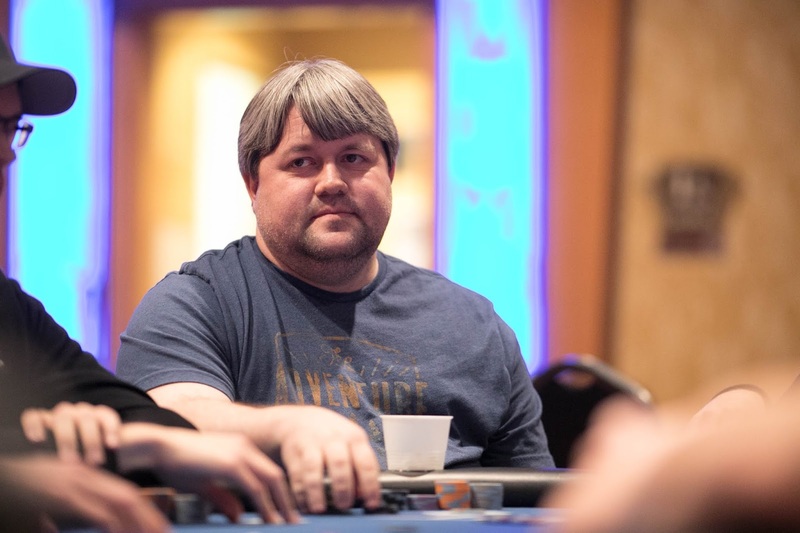 Jamey Komeback Kramer somehow managed to survive slipping all the way down to 1,700 chips in Level 7, building it all the way back to a 113,000 Day 2 Bag. Among those who came out for Day 1A and did not find a Day 2 Bag is Dennis Phillips, Nick Davidson, Craig Casino, Shawn Roberts, Roger Campbell, Gary Herstein, Neil Patel, Mike Kamenjarin and Derek Schroeder. Day 2 begins Saturday at Noon - not the two-hours-earlier-than-today's-flight starting time - with registration and the unlimited-entry period open until level 10 begins at about 7:30pm. Here's the chipcounts for the 28 players - from a Day 1A starting field of 164 - advancing to Sunday's 11am start for Day 2.